For those who have red before my review articles about the newer Minichamps models is easy to understand that I was pretty reserved adding a new model from this manufacturer in my collection. 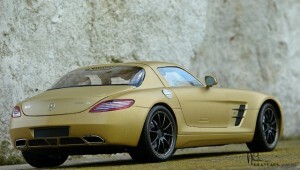 But the model itself is a must for a supercar collection and the price was a great opportunity. 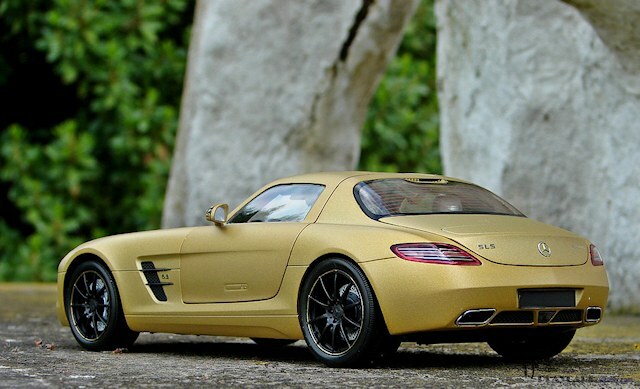 So, I pulled the trigger for the matte gold Mercedes Benz SLS AMG. 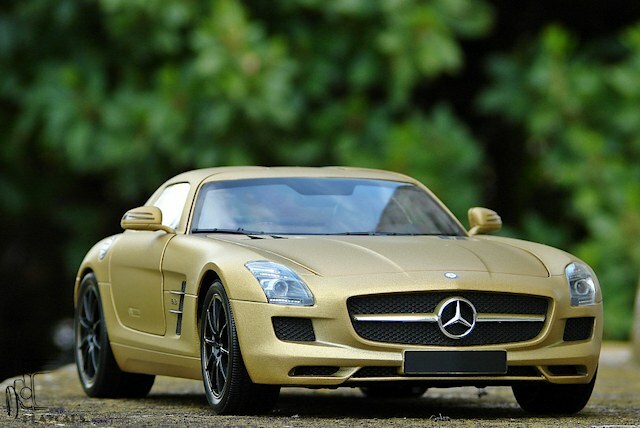 Even if the gold wasn’t my initial option, must say I’m not disappointed at all and seeing the model in real proved that I’ve made the best option. 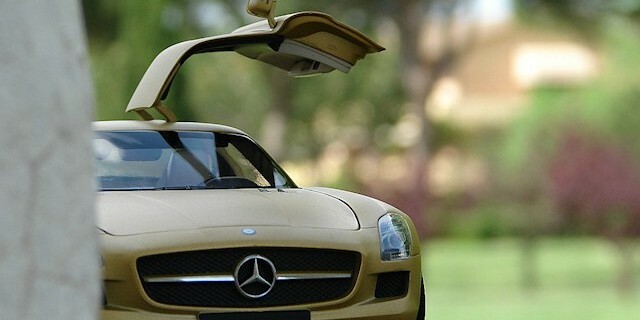 It comes in the usual Minichamps polystyrene box and a second card-box having printed on the photos of the model and some descriptions and technical specification about the real car. Model itself can be detached from its box without using a screw driver, the latest fixing system that Minichamps provides can be unscrewed simply, rotating the attaching piece with your fingers. 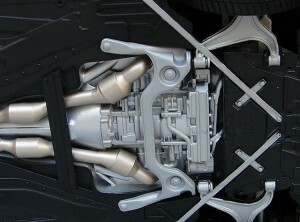 The model is very heavy being made of a lot of metal, including here the spoilers and sills. And if we were talking about the paint before, this is wonderful and very different in real than everything I’ve seen in the photos before. The paint job is perfect and the layer is uniform, thin applied and metallic. The matte effect fits this shade perfectly. Seem that they respected well the proportion and the stance of the real car. The model appears well put together, solid and with minimal shut lines. As usual Minichamps doesn’t used real meshes to cover the air intakes and this isn’t a good choice. The headlights are very well made, respecting the details inside and the LED segments are the best I’ve seen so far replicated on a model. Same impression for the taillights, properly shaped and coloured. The turn signals are correctly made and integrated in the external mirror’s body. In the centre of the rear bumper, the fog lamp wasn’t so great detailed, having a strange shade and being attached with a visible stub. The third stop lamp is only a sticker, having an improper look for its initial purpose. On the front side the three pointed Mercedes star was fine replicated and covered with a qualitative chrome. 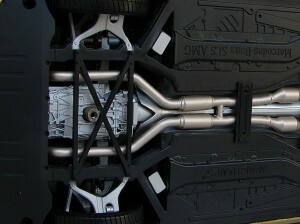 Same thing for the final part of the exhaust pipes. All the badges and lettering are photo etched metallic parts and are looking very good, especially if we take a look to the star logo on the rear bonnet. No real license plates or other marks were provided, even if the plates were replicated. For the fuel cap, they’ve chose to mould a separate piece and keep it silver in order to looks as its real counter part. My model comes with the second version of rims, more sportive looking, having the right proportions (are bigger on the rear side) and painted in black. The outlines are fine painted in the body colour, spokes are fine and the stud heads were modelled. For the brake system they’ve replicated well the huge calipers and marked them with AMG lettering and the rotors were kept black. The disk brakes are dimpled to fake crossed drilling, but are finished in hurry. The dimples are too big and some of them are still painted in silver, even if a black-wash effect was applied after. Tires have the correct profile, but aren’t branded. The exterior looks very good and properly finished, having many strong parts and not many things to complain about. 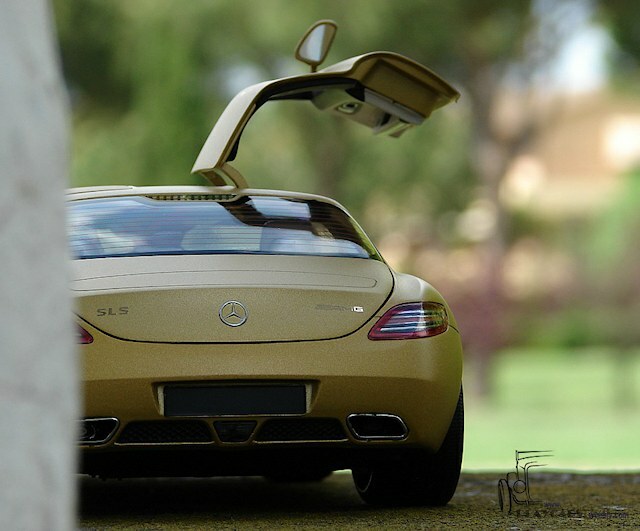 The “gull wings” doors are opening on classic big sized hinges to give a proper opening angle. The good part is that are able to stay open by itself. Is revealed a very good looking and finished interior. All the switches and buttons were modelled and individually painted or marked. The shift gear, air vents and the steering wheel were very good realized and painted. Is a surprise for me to find such a good interior in comparison with the bad experiences in the past with models of this manufacturer. This is an evident progress and is easy to be observed just looking to the central console and door entries were the carbon fiber was excellent replicated. Coloured and legible stickers were used to re-create the navigation display and meter dials. The seats are right modelled and are painted in a dual tone, only the black paint used here being to shinny for my taste. Have applied the AMG badge on their backs and the command switches nicely modelled and marked. Door panels are detailed and keep the same interior’s colours. 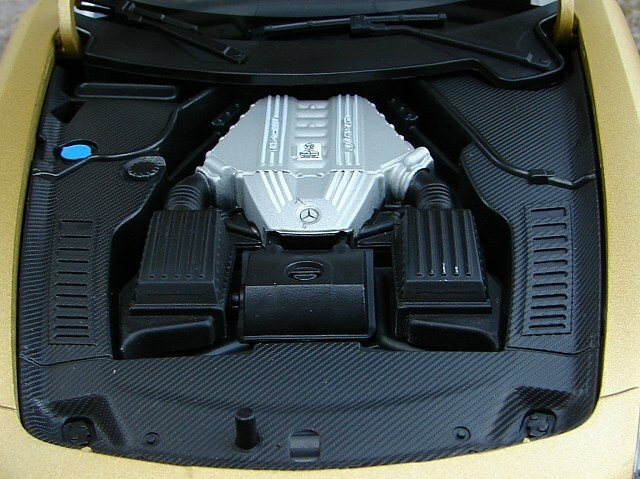 The interior is carpeted and has the AMG letters painted at the foot’s level. Minichamps didn’t replicate the seat-belts, but this isn’t an inconvenient, the cockpit is carefully detailed and finished. Very good job here! The huge front lid is opening pressing a button underneath, but because of its dimensions is difficult to keep it open. A strut was more than welcomed here. The engine bay has the same poor look as in the real car, a single blue painted cap trying to catch your attention from the surrounding black panels. They’ve textured the plastic here, to replicate the carbon fiber, but if they’ve chosen to use the same decal from the interior, could be leaded to an awesome result. Rear bonnet is opening on huge hinges and reveals a black carpeted compartment without any other detail. On its inferior side a carpeted panel was applied and this is a nice detail. The spoiler was only modelled and isn’t active. Underneath a lot of details were replicated and are visible: the exhaust system, gear box, engine and the functional suspension’s parts. 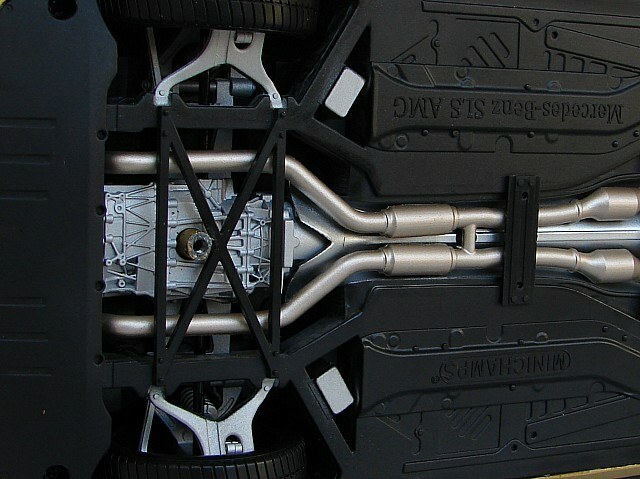 No real springs were replicated for the suspension system. 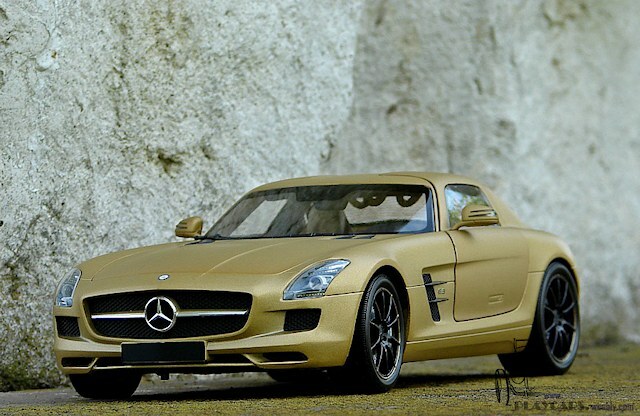 Must admit that this model is a very good surprise for me. Is very good looking, detailed and finished, without issues from the previous models. For sure some parts require more attention in detailing. Even if is a newer release in this shade, the model keeps the old mould which was better detailed from the beginning. 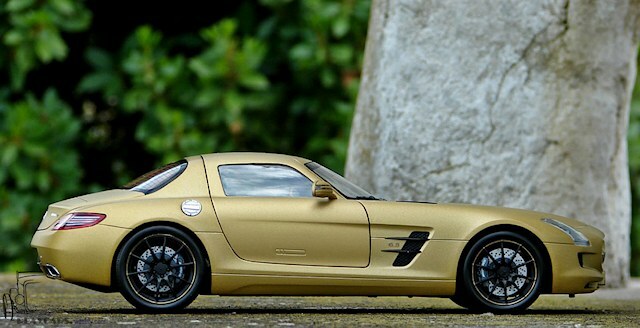 Looking at the recently released models I can only realize that the SLS was an exception, Minichamps keeping their awfully reproduction style in making models. Is very said for the hobby. For me, is one of the latest Minichamps models which I will add to my collection. SLS is for sure one of the best models as far that they’ve released in the last years.